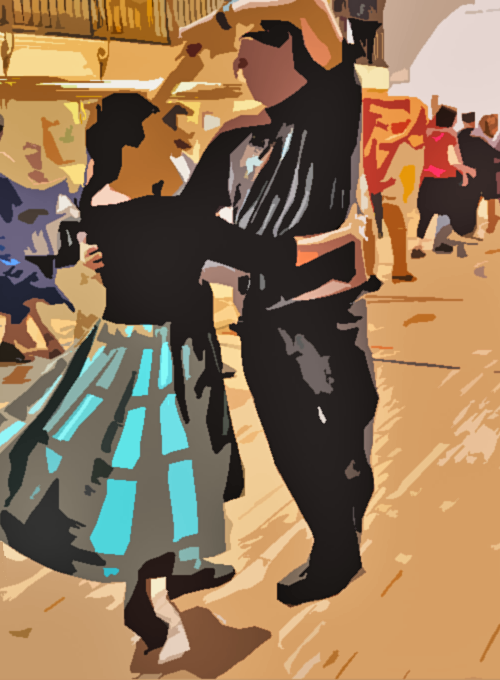 My guy, Nez, introduced me to Contra dancing which is New England style folk dancing where couples move down two facing lines, exchanging partners and who knows how many microorganisms as they go (have I mentioned I’m a bit of a germaphobe?). Each week I come prepared with comfortable shoes and a big, bottle of hand sanitizer. But, I love it. Contra dancing is awesome. Sweaty, but awesome. Though, actually, the dancing doesn’t sweat, it just causes me to, which is why I’ve purchased a few swishy skirts and dresses to help keep air circulating around me as much as possible. Recently, I bought this flowing, off-the-shoulder, tie-dyed dress, and I wore it to the next dance where I proceeded to twirl and swing and do-si-do with Nez and umpteen others. I had a grand time. As we walked to the car afterwards, though, I noticed Nez’ hands were all blue and purplish. We were like, WTF? Was there a newly painted rail somewhere? Something on a door handle? Had he contracted a strange, rare palm disease? Nope. I’d not pre-washed my dress and the dye (aided, I’m sure, by all the perspiration) had worn off on his hands. Then it hit me. LOTS of men had danced with me, hands on my waist, that night. Oops. My apologies to those who went home wondering if they’d lost all circulation to their extremities.